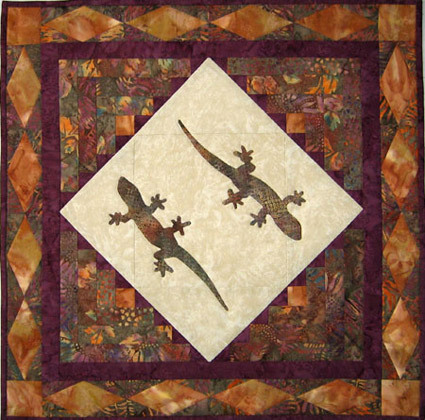 Thank you Michele for including me in your guest blogger spot and I hope that people will be interested to read a little about quilting in the tropics. 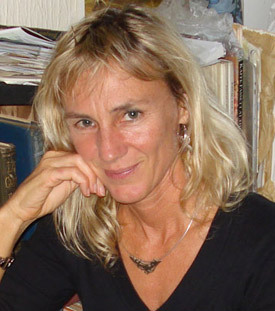 I am originally from England but have lived overseas for many years. For the last fourteen years I have been living in Brunei which is a tiny country ruled by the Sultan of Brunei, on the island of Borneo in South East Asia. This tropical location is a wonderful source of inspiration for the art quilts that I like to create, although living in this far away location it can be difficult getting supplies and I have to rely very heavily on mail order. I have loved fabrics and making things for almost as long as I can remember, collecting scraps as a child so I could make dolls’ clothes. I always preferred making the clothes rather than actually playing with the dolls. I made my first patchwork quilt when I was about thirteen using dress fabrics and the method of paper piecing that was popular in England then, using paper templates to create a Grandmother’s Flower Garden Quilt. 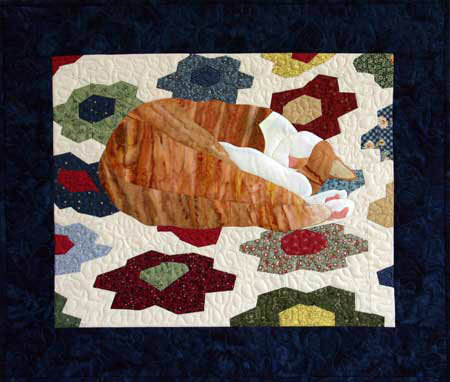 My mum still has this quilt and it features in a wall hanging I made last year which shows our first cat, Jasper, curled up asleep peacefully on the quilt. This quilt was quite a challenge to make as I wanted to piece the background and appliqué the cat. I thought about it for a very long time before I came up with the idea of foundation piecing the patchwork background. It took a lot of working out but then the piecing was quite straight forward. I chose to use country style and vintage reproduction style fabrics for the ‘flowers’ because of the old fashioned nature of the quilt. 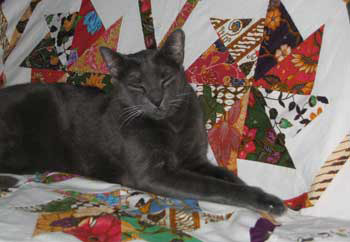 My first quilts were very traditional and mostly hand sewn, and very few of them were even quilted. When we first came to Brunei I collected a variety of brightly coloured printed batik sarongs and then cut them up and hand pieced them to make a large bed cover. I made the mistake of not prewashing my fabrics, so some of the bright colours ran a bit and the muslin shrank, but those were early days and I’ve learnt my lesson since then. The cats love the quilt anyway! Having lived overseas for so many years I haven’t had access to quilt classes or workshops so I am mostly self-taught, learning almost everything through books and magazines. I was drawn towards appliqué because I loved the look of the classic Baltimore quilts, but it was a while before I could find good books and start learning hand appliqué. I stuck with that for a few years until we got our first computer and then, at around the same time a friend showed me EQ4 and I immediately got my own copy. That marked a real breakthrough for me because at the same time I found out about Quilt University and their online classes and signed up. The rest is history as they say; with the help of Electric Quilt and Quilt University I gained the confidence to start designing my own quilts and learnt about art quilts which I had never heard of before. This is one of the first of my original designs that I created. I found that suddenly the ideas that I’d had in my head for ages but never had the confidence to try making were now possible. I discovered that creating art quilts is the thing that I like best of all. The designs I create reflect my love of nature, and a lot of them are directly inspired by my environment here in South East Asia: the creatures, exotic flowers from our garden and the tropical rain forest. Usually I start off with a photo that I’ve taken myself and then adapt it using EQ6 to make a quilt design. I like to make realistic designs and my favourite method is appliqué, both by hand using silk thread and by machine, using a combination of invisible, satin stitch or raw edge depending on the design. I find hand sewing relaxing and I like the feel of manipulating the fabric and molding it to the shape I want. My favourite fabrics are batiks and I seem to have a bigger pile of greens and browns than anything else, although brown is my least favourite colour but comes in so useful for my rain forest inspired designs. I make mostly small wall hangings and over the years I have built up a small business locally, mostly with the expat community here in Brunei and my quilts have gone all over the world. I enjoy encouraging others to share my passion for quilting and from time to time I run courses at my local club. 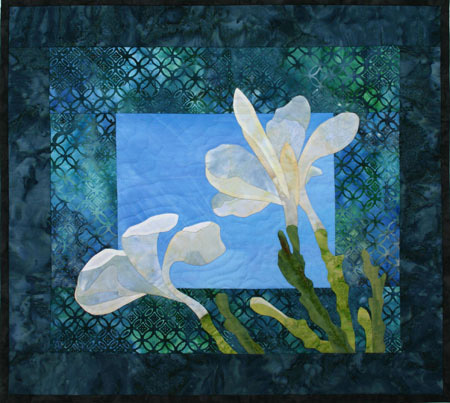 So far I have only taught the basics of piecing, appliqué and quilting but at some time in the future I would love to introduce people to making pictorial and art quilts. A few years ago I set up my own web site to showcase some of my work and then very recently I started my blog ‘Anne’s Creative Threads’. I started the blog so that I could write in more detail about my quilts and in particular about my inspirations and how I go about creating my designs, also a little bit about my life here in Brunei and what goes on here. I haven’t had time yet but I would also like to include free tutorials, projects and patterns on my blog. I haven’t been writing my blog for very long, but I have really enjoyed hearing from different people around the world and looking at other people’s blogs too. My latest venture is to try selling my wall hangings further afield so I have just set up a shop on Etsy. Sensational work! Such flare and imagination! Keep it coming! Amazing stuff! Great to hear all well and that you are still following the addiction. I am still in Muscat Oman. I seem to have done a lot of wholecloth quilts but am now working on a kingsize flower garden (just to keep me busy). Take care and best regards. I am so proud to tell everyone that it was you, who taught me how to quilt, got me hooked and inspired me to create my own (but much simpler designs) wall hangings. hi Anne, i am a Bruneian, im am a big fan of quilting. i am a male. For me quilting is a very beautiful art and need skills. Here in Brunei not many local are into quilting, honestly none that i know. I love to learn the skill of quilting, i never quilt before.. now am learning through youtube but it quiet difficult to learn without doing it and here the quilting material are difficult to find. Hope someday i could learn from you. What you did was amazing..
Hi Handi, thank you for your comments and glad to know that you are so interested in quilting, keep up the good work. I’m based in KB and I do run classes from time to time and have had my work on display here too. There are several shops in both Bandar and KB which sell quilting materials. Hi Anne, thanks for the replied. I do buy some materials in Bandar, but its too expensive. Anyway i live in Muara, i love to attend your classes but its quiet far, hope there are quilt classes in Bandar. By the way, nice to know you. The Gecko design are so beautiful and creative. Hope to see more of your master piece. i simply love all the lovely work you have been doing in quilting. they are stunning especially the nature quilts. I have been desperately trying to search for classes for quilting in Brunei. I am just wondering where do you teach your lessons. It would be really nice if i have a chance to try out quilting. Thanks. :).. Thank you for sharing your love of quilting with the world through your blog and via the folks in Brunei of all places. You are very talented and your quilt colours are lovely. As an expat who relocated to BSB from England recently I learned about your blog from a Canadian friend of all people. She is a talented potter, but is also into other crafts as well and came upon your blog and sent me the link. It’s a small world isn’t it? I work at UBD so if you ever want to tap into the university community just off of Tungku Link, meet some students here or have a coffee sometime just let me know. We would have loads to talk about as I was living in England for 20 years (Cambridgeshire, South Yorkshire then Somerset) though I was not born there. Well, I just wanted to say thanks for sharing your talent with others and wish you well. Take care. Beautiful work!!! Any chance you would ever publish the cat pattern?